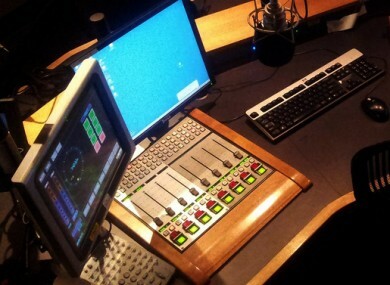 File photo of a radio studio. MEDIA GIANT COMMUNICORP is set to bring as many as 2.8 million UK listeners within its reach with the proposed acquisition of a string of radio stations. The sale is currently subject to approval by the Competition Authority in Ireland, but has been approved by its UK counterpart. Communicorp Chairperson Lucy Gaffney said the move reinforces the company’s “position as an international market leader”, with an established presence in Ireland, Bulgaria, and Latvia. “These eight radio stations have shown great resilience in recent years and we look forward to continuing to drive each station to their full potential,” she said. The management teams at the stations owned by Real & Smooth Limited owned will remain in place. Communicorp intends to expand the DAB capability of the Capital stations included in the acquisition. “Each of these stations has a strong and loyal following and this move will make Communicorp the fourth largest commercial radio group, in the UK,” CEO Gervaise Slowey said. Email “Communicorp to snap up eight UK radio stations”. Feedback on “Communicorp to snap up eight UK radio stations”.